This study investigated the effect of silicon (Si) on maize resistance against macrospora leaf spot (MLS) caused by the fungus Stenocarpella macrospora. Maize plants susceptible to MLS were grown in a Si-deficient soilless potting mix and irrigated daily with either potassium silicate solution or potassium chloride solution. The amount of potassium was equilibrated between the solutions. The severity of MLS was evaluated at 48, 72, 96, 120 and 168 h after inoculation and data were used to calculate the area under MLS progress curve (AUMLSPC). The foliar Si concentration in Si-supplied plants (2.8 dag/kg) significantly increased in comparison to non-supplied ones (0.6 dag/kg). The AUMLSPC was significantly reduced by 42% in Si-supplied plants (368.3) when compared with non-supplied ones (635.0). 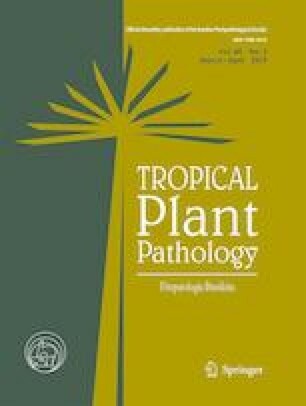 Fungal hyphae grew abundantly in the leaf tissue of non-supplied in comparison to Si-supplied plants based on light and scanning electron microscopy observations. Cell walls in the leaf tissue of Si-supplied plants were rarely degraded, and fungal hyphae were surrounded by phenolic compounds. In conclusion, marked differences in the infection process of S. macrospora were noticed between Si-supplied and non-supplied plants. The role of Si acting as a physical barrier and potentiating the phenylpropanoid pathway in maize was of great importance for resistance to MLS. Prof. F. A. Rodrigues thanks the CNPq for his research fellowship. The authors thank the Núcleo de Microscopia e Microanálise of the Universidade Federal de Viçosa for the use of their equipment. This study was supported by grants from CAPES, CNPq, and FAPEMIG to Prof. F. A. Rodrigues.